“Saruman here. Severus Snape is actually the president of the GSA, or Good-Sinful Alliance, but as he’s busy today I’ll handle this. Are you evil? If so, have you ever felt left out because while everyone supports good rights, no one supports you in your exploits? 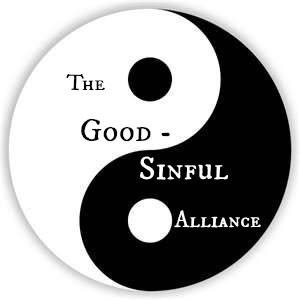 Or are you good but a supporter of evil? Look no further! The GSA was intended to provide support for all evildoers as well as to educate the world about us. For more information, please call 1-800-GOT-EVIL or take a look at the links provided below. This page will be updated periodically, subject to our busy schedules of evildoing. Oh my Gollum, this is lovely. Silly Saruman, forgetting to try to enlist members. Tut, tut. Although, honestly, I was silly enough to look at some of the post-links, thinking, “I’ve never seen these before! Who wrote them?” before realizing that they were my posts. Excuse me, milady, you did not “let” me co-lead. If memory serves, you tried to poison me. I’m co-leader by dint of my own strength. Want some cookies? They’re probably not toxic. No, thank you. I refuse to be taken in by any trickery unless they’re black-and-white cookies, I can’t resist those. I never make any other kind! Awesome, thanks! I take it that you’re an ally? Do you have any evil friends to bring along? Daleks, perhaps? Yep! Daleks are my bffls so we shall see you there!